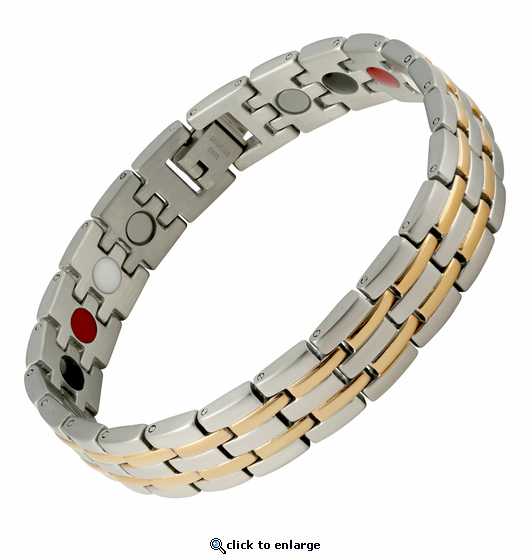 This is a cutting edge technology stainless steel magnetic therapy bracelet. It is styled in brushed silver with shiny accent 18k gold stripes and is about 1/2" wide. This therapy bracelet that has 4 wonderful things going for it, so we call it 4 in 1. This style has the following 1) 3300 gauss bio north facing magnets(silver), 2) Germanium(Black), 3) , Far Infrared Ray technology(Red), and 4) Negative Ion technology(white). We hope you will enjoy this wonderful bracelet that combines 4 technologies that are believed by many to help our bodies naturally in many different ways. Meet a gentleman at benefit & my husband complimented his bracelet. It reminded us of a watch band that I have. Purchased It for my husband for his arthritis in both his hands. It looks great just waiting for it to work its magic and help his pain. I have bought other negative ion bracelets in the past that look like an exact mirror of these brackets for over a hundred dollars, so for the reasonable price I was extremely impressed. Great bracelet. Exactly as described. Fit is perfect. Measure exactly as outlined and youll be 100% satisfied. I recently purchased these two bracelets for a friend. I purchased two for me over a year ago and my arthurites issues in my fingers has subsided immensely. I like your product for what it does and for the great clasp on them so I'm not concerned about loosing them by coming undone. After having lost two previous golf bracelets due to slip offs, this style is a perfect solution. The ordering process was was spot on and the delivery to our address very timely. this is my 4th. purchase.these bracelets really help the pain my husband has in his hands.would highly recommend. Love my new bracelet and it is starting to work on my hand . I need my other bracelet fix"ed , but I will get back to you on this later. Lost my first one somewhere on the golf course. Bought a replacement and could not be happier. Have started to see benefits to my aches. I bought these bracelets back in June 2017 and started wearing them as soon as they arrived; one on each wrist. I didn't see any change at first but my chiropractor who recommended them to me said that sometimes it takes awhile to see a difference. Sure enough, in about two to three months I noticed a great difference in the arthritis pain level in my fingers. It is almost completely gone. Thank you MJS for such a good product. I also love the quality clasps which never come undone unless I take them off. I don't take them off that much unless in the shower, because I sleep with them as well as wear them all day long. I received the bracelet two days ago and I put it on immediately. It fit just right as I followed your direction on sizing. The quality of the bracelet appears to be very good and hope to wear for many years. I ordered a silver/copper bracelet and I love it, I ordered by using the helpful measurement instructions! I will be ordering more as the prices are reasonable and the products are awesome as well as is the customer service being very caring. May God Bless you all and may y'all have a Happy Thanksgiving filled with family and love! Makes a difference and looks great! I bought this for my boyfriend who wore a brace on his wrist every night for pain due to carpel tunnel, arthritis and overexertion. Since he started wearing this bracelet, he very rarely wears his brace. He likes the look and feel of it and gets lots of compliments on it. I think it looks really sharp on him too! Will and have recommended to friends. I wore a bracelet very similar (just magnets) to this one for years, until I recently lost it. I have an injury on right arm and was told years ago after surgery that I would have arthritis in my hand. I went without a magnetic bracelet for about 4-6 weeks to test the theory, and had a lot of pain shooting thru my wrist and hands I received this beautiful replacement with upgraded stones and my shooting pain has subsided immensely. I am convinced that it works..I never take it off.. Very happy with my new bracelet. I am Very Happy with my purchase of this bracelet. It looks very good and fits much better than my previous one purchased over ten years ago. It has helped me and I would recommend this style highly. I have used these for years and every so often need to have it replaced because they wear out. They have made a big difference in my health, everyone thinks its a watch and it gives me the op to explain what they are and how they work. I started using them after I broke my collar bone, I was 50 years old then and they made a big difference in my recovery that I decided to wear two, one on each wrist.